Doncaster Knights came away empty-handed from a Championship game on the road for the second time this season. The defeat at relegated London Irish on the opening day of the season wasn’t totally unexpected but this was not so the case in Saturday’s 27-14 result at Ealing Trailfinders. Ealing are now finding their feet in their second season at Championship level and have recruited well in the summer, but Knights went into the game as favourites. But a combination of indiscipline and individual mistakes, both in attack and defence, cost them dearly. 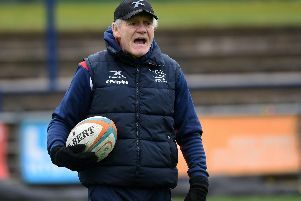 Knights boss Clive Griffiths admitted after the win over Bedford Blues last time out that there were certain aspects of the team’s defensive work which needed to be worked on. It wasn’t hard to see where he was coming from for Knights had shown a tendency in most of their games this season to concede a soft try after defending solidly. Ealing had the better of the early pressure and but for a handling error when well placed could have gone ahead. A heavy penalty count didn’t help Knights’ cause and it wasn’t until the end of the first quarter that they started to show some cohesion in attack. Ealing, who held Knights 17-17 on the same ground in February, opened the scoring when strong-running centre Joe Munro was put through by fly-half Aaron Penberthy who also added the extras to make it 7-0. Knights drew level shortly before the half-hour - speedy wing Tyson Lewis breaking the line and sending centre Mat Clark over out wide for a try well converted by wing Dougie Flockhart. Ealing opened up a 13-7 lead in the third quarter with a brace of Penberthy penalties. The game could have turned out differently had second-rower Dave Nolan managed to score from a charged down clearance kick from a lineout close to the line. Knights were also out of luck when Flockhart was wide with a long-range penalty attempt just after the hour mark. A 13-7 deficit became 20-7 on 65 minutes after full-back Paul Jarvis saw his attempted defensive clearance kick charged down. Although Carwyn Jones was held just short of the line, Doncaster’s relief was short-lived with the ball being moved out wide where centre Aled Jenkins touched down for a converted try. Ealing put the result beyond doubt when wing Curtis Wilson touched down after Knights had lost the ball in the tackle. The introduction of fly-half Declan Cusack off the bench served to give the Doncaster attack more of a cutting edge and, following an earlier break which could have led to a try, the Irishman touched down for a try he also converted after combining with Clark. Knights came close to a losing bonus point at the death but replacement Sean Scanlon couldn’t get the ball down over the line in the corner. Doncaster Knights: Jarvis, Flockhart, Clark, Hayes, Lewis; Humberstone, Heaney; List, Hunter, John, Nolan, Young, Makaafi, Robinson, Shaw. Rep: Hislop, Allen, Sprotson, Williams, Scanlon, Cusack, Edgerley.